Published Sep 20, 2012 by Pearson IT Certification. Part of the LiveLessons series. This lesson establishes the structure for the rest of this course by laying out the process required for becoming a project management professional. This lesson walks you through the process of filling out the application forms step by step. This lesson focuses on the three different learning modalities: audio, visual, and kinesthetic. At the end of this lesson, you'll be able to create a study plan that fits the time you have available to pass the exam. At the end of this lesson, you will have a set of general hints and tips for passing the PMP/CAPM exam. This lesson begins the mini course within a course called Exam PREP. You will listen, watch, and learn about the project management framework from the perspective of the PMBOK Guide and the PMP Exam Specifications. In this lesson, we continue the PMP Exam PREP review. We concentrate on the project-initiating processes, and we cover the Scope Knowledge Area of the project -planning process. 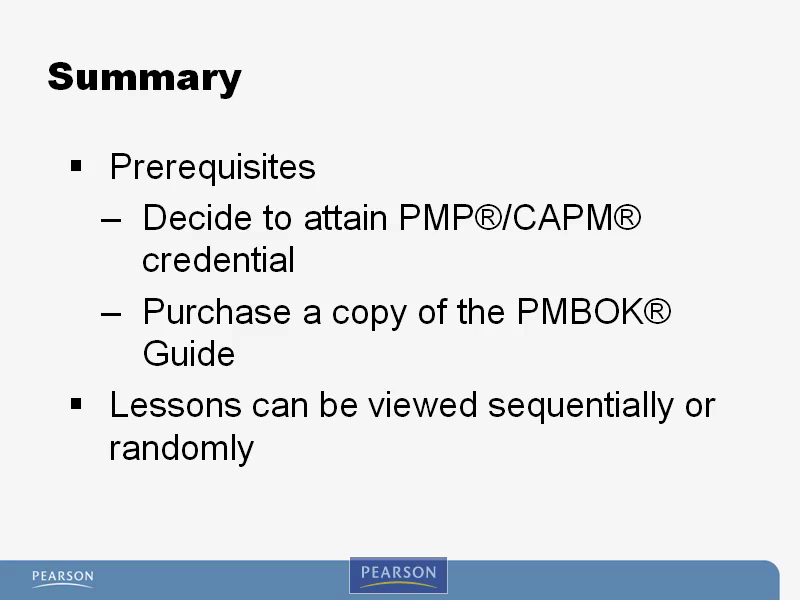 In this lesson, we continue the PMP Exam PREP review. We concentrate on the project-planning processes, and we cover the Time Management Knowledge Area and the Cost Management Knowledge Area. The PMP Exam Prep mini course continues with a review of the project-planning processes. This lesson will cover the Quality Management, the Communications Management, the Humans Resource Management, and the Procurement Management Knowledge Areas. In this lesson of the PMP Exam PREP mini course, we cover the planning processes of the Risk Management Knowledge Area. In this lesson of the PMP Exam PREP mini course, we will review the executing process group and all of its processes. This review will cover processes in the Integration, Quality, Communications, Human Resource, and the Procurement Knowledge Areas. We now move into the monitoring and controlling process group and begin our review of these processes. The Knowledge Areas included here are Integration, Scope, Schedule, Cost, and Quality. In this lesson, we finish our review of the monitoring and controlling process group. We'll review processes in the Human Resource, Communications, Scope, Risk, and Procurement Knowledge Areas. This is the final lesson of the mini PMP Exam PREP course. We will review the closing process group and the concepts of professional and social responsibility. This lesson provides suggested day-by-day activities that you should perform the week of the exam. Lesson 17: Need More Support? This lesson provides some suggestions for books and courses that you might consider if you decide you need more support passing the exam. When it comes to passing the PMP certification exam, you’ll find no better resource than the PMP Video Mentor. You get video-based tutorials from one of the nation’s leading PMP instructors, Claudia M. Baca. Following the PMI’s curricula, the PMP Video Mentor has everything you need to know to pass the PMP certification exam. Not only will you learn how to prepare for the exam, you will also get useful tips for completing and filing your paperwork, and discover useful things you should do on test day. Everything’s taught visually, using realistic project scenarios. You’ll master project initiation, planning, scoping, scheduling, budgeting, execution, monitoring and control, closing, quality, communications, procurement, PMI’s professional/social responsibility rules, and more. Learn at your pace, get the answers whenever you need them, and gain the confidence you need to ace the PMP certification exam! For all current and aspiring project managers who are preparing for the Project Management Institute’s PMP or CAPM online certification exam. Looking for a better way to master today’s rapidly changing technologies? Want expert help, but don't have the time or energy to read a book? Can't find classroom training worth the money? Discover Video Mentor: self-paced, personal video instruction from the world’s leading experts. Video Mentor are video courses, that are organized into bite-sized, self-contained sessions--you'll learn key skills in as little as fifteen minutes! Imagine the best live project management training...then make it more convenient and far less expensive! Just click, watch, and learn as Claudia M. Baca teaches you everything you need to ace your exam...from study planning through PMBOKRGuide best practices! Lesson 3 How Do You Learn Best? Lesson 17 Need More Support?